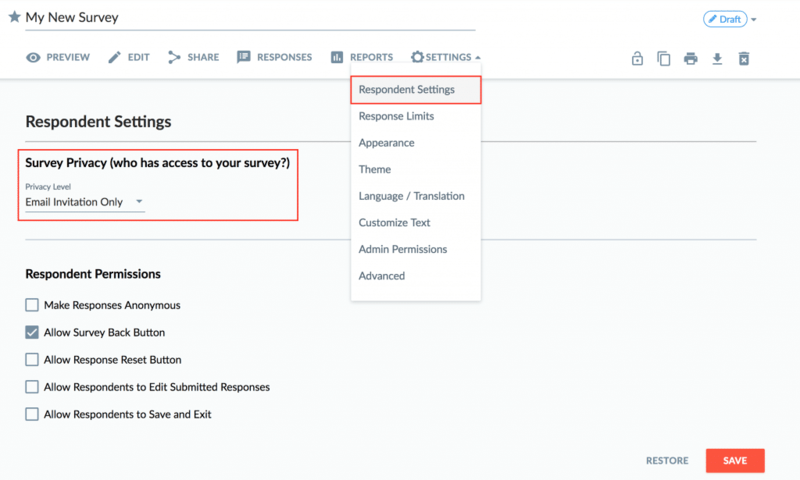 You will see fields to set the total response limit (total complete responses you want to allow) and the per respondent limit (number of complete responses per user you want to allow. You can set one or both limits, keeping in mind that the total response limit must be equal to or greater than the per respondent limit. Click Save. Note: We don’t recommend that you change response limits while your survey is active. However, in order to enforce a per respondent limit, surveys must be set to Access List, All Registered Users, or Email Invitation Only. This is because Checkbox must be able to track the respondent in order to enforce the limit. You can verify your survey permissions under Settings -> Respondent Settings.